Is there a more intimate decision for you than where to seek medical care? If there is, we can’t think of it. We’re blessed to have so many different choices for healthcare here in Columbia, but time and again we come back to Boone Hospital Center. The level of service we have received there is indescribably awesome. Matt LaCasse, who handles our social media, and his wife chose Boone for the birth of their daughter last August. “The first time we went to meet with Dr. Mark Grant at Boone we knew we weren’t going anywhere else,” said LaCasse. “From our prenatal care with Dr. Grant to the genuine interest and care we got from our nurse Ashley Ranow, we knew everyone in that building was invested in our care and experience. We couldn’t have had a better experience welcoming Libby into the world.” That story really sums up everything we love about Boone Hospital Center. Hospitals are not a place most people willingly or enthusiastically go to. Boone’s staff, from new President Jim Sinek all the way to the LaCasse’s nurse, are completely invested in the health, well being, and experience of their patients. 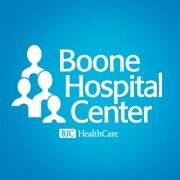 For all these reasons and more we recommend you connect with Boone Hospital Center on Facebook and Twitter. Do you have a Boone story?